Many foodstuffs have high levels of salt, or fat, or sugar, or something, especially snacks and sweets. The government obviously want to fix this, being a "nanny state", and make it clear to people that the thing they are buying is bad for them. So, they get manufacturers to add some traffic light things that show if levels of a few key things are high or low compared to recommended daily intakes. That will make it clear where things are bad for you. But hang on, clearly, some things are sold in packages that are not one portion. A packet of breakfast cereal or a tub of butter are perfect examples. You can't rate the whole package, you have to rate a typical "serving". So manufacturers get to suggest a "serving" size. Now, if that serving size was bad for you because of some very high level of some metric, then of course, the responsible thing for them to do is recommend a smaller serving. End result, all things are good for you in the suggested serving size. 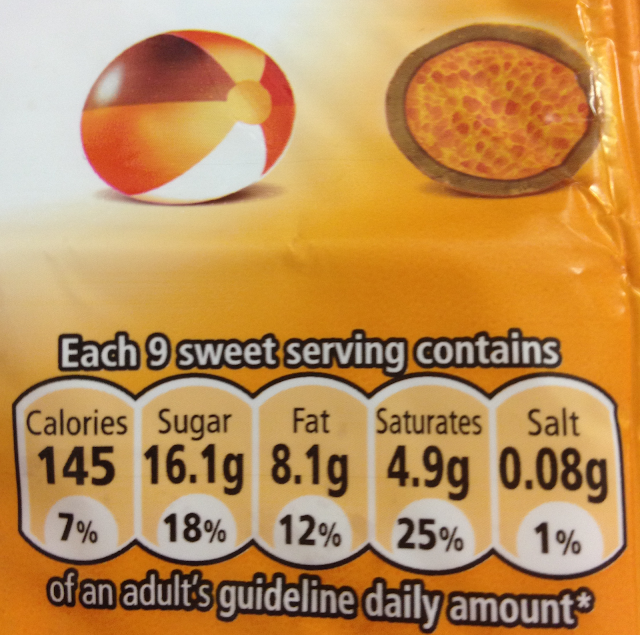 Taken to the extreme - see picture - a bag of aero bubbles has a suggested serving of 9 sweets. That seems to work out to be around 27g. They show on the back details per 100g and per 9 sweets. Its a 113g bag (about 38 sweets). Indeed, it was a small bag, IMHO. Precisely the sort of thing I've found with say Weightwatcher's foods. The values are only lower because the portions are smaller; I've often found that 'normal' foods have lower calories, sat fat etc. for a given amount. *provided you eat almost none of it. I always wondered who ate those 30g servings.